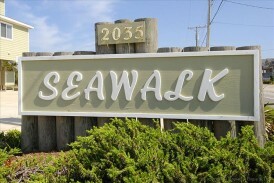 SeaWalk is a complex of 18 unique oceanfront and ocean side condominiums in Kill Devil Hills, NC situated with the community pool between the two buildings. There are outdoor showers and coin operated laundry facilities. All units have private balconies and ample parking.